About a month ago, The Horn Player and I were invited to a late supper at my aunt and uncle's home. Another couple was invited as well, so while we watched the two of them cook, we sat around the kitchen bar and enjoyed the show. Allow me to explain. My uncle has this uncanny ability to tell a "yarn" on someone (as my grandmother would say) and animate the telling with an impersonation or two. Drawing from the rich collection of happenings during his childhood and beyond, he spins his tale while gesturing dramatically with his hands. He's hilarious. Everyone leaves there with a laugh stored up for the next time the evening is recalled. He's my favorite story teller. And my aunt is his perfect companion in life, as well as in the kitchen. While he usually cooks the main course, she provides the rest. Everything is served buffet style, perfectly placed and perfectly proper. She loves to cook "special" things and this time she definitely proved that to all of us. Tomato and Basil Pie was our appetizer and even though The Horn Player declares utter disdain for most veggies; he loved her pie. I couldn't wait to make it myself with some garden fresh tomatoes. Which brings me to the next part of this story. At choir practice last Sunday evening, one of my soprano friends asked if I'd like some tomatoes from her garden. Bingo, Tomato and Basil Pie, I thought. Beautiful Louisiana Pink tomatoes make for a lovely pie, I must say. So I made this for supper yesterday, tweeking it a bit by using puff pastry dough instead of a pie shell and adding a bit of green onion. Thanks to everyone for my "Summer Supper". Place the peeled and sliced tomatoes on a rack and sprinkle with a bit of salt. Allow to drain to release some of the moisture. You could do this as much as 30 minutes in advance. Hint: Before placing onto the dough, blot the tomatoes on a paper towel to remove excess moisture. Mix the mayonnaise and both cheeses together in a bowl and set aside. Line a sheet pan with parchment paper. Heat the oven to 425 degrees. Place the puff pastry dough onto the parchment paper and smooth out the folds. Using a sharp knife, cut a line inside (a type of perforation) on all four sides of the pastry about 1 inch from the edge. Do not cut all the way through the pastry. This will allow the pastry to create a raised area around the tart. Place in the oven for 5 minutes to pre-bake the dough. After the dough is removed, reduce the heat to 400 degrees. To assemble the tart, arrange the tomatoes on the inside of the perforated edge and cover with basil and green onion. Add salt and pepper at this point, keeping in mind you salted the tomatoes to draw out the moisture, so sparingly. 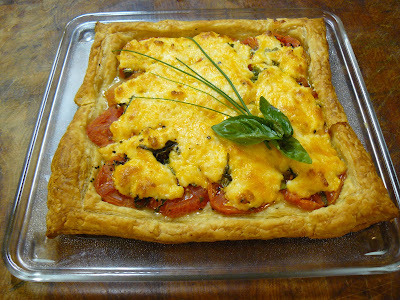 Dot the top of the tart with the mayo/cheese mixture and smooth out to the edge of the tomatoes. Bake for about 25-30 minutes, or until the whole thing is golden brown. Slice and serve immediately for an exceptional appetizer or with a salad alongside for a light supper or lunch. Living in the South and more specifically in Louisiana, it's almost a given to say my passion is cooking. The heritage of food in my world has so many cultural influences. Our food is a mirror image of our people; a wonderful gumbo of flavor and diversity, which makes me very happy to live in this beautiful place. Anny-The Red Plate. Awesome Inc. theme. Powered by Blogger.